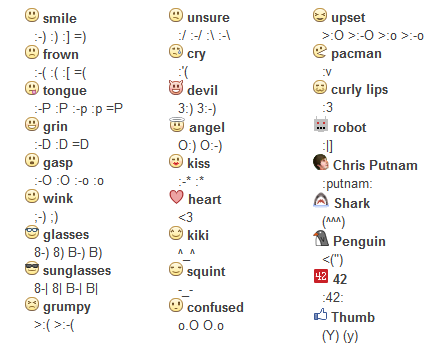 We posted a popular Facebook Emoticons a couple of weeks ago and many of our clients told us that it’s helpful. Last time those Facebook Emoticons and Smileys were on an image which means that you can’t copy and paste them directly from it. Now we type them all below so that you can easily grab it to use in your Facebook comments. We also posted the image version again so that you can see how those Facebook smileys look. Note: You will see some smiley face showing up in the list below. Those are the sharable smileys that work on WordPress as well.